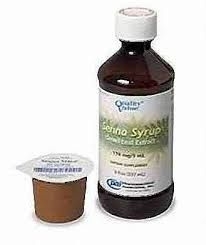 Senna Syrup Dietary Supplement - 8 fl. oz. - As a dietary supplement, take as recommended below or as directed by a doctor. Take preferable bedtime. This product contains Senna. Read and follow directions carefully. Do not use if you have or developed diarrhea, loose stools, abdominal pain, intestinal obstruction, or hemorrhoids. Consult your physician if you have frequent diarrhea, are pregnant, nursing, taking medication, or have a medical condition. Do not take for more than seven consecutive days. - Do not use if the protective printed band around the cap is broken or missing.